Rosehagen Culture & Business Park is a historical wooden villa beautifully placed in a big surrounding garden overlooking the Jørpeland Bay. The garden boasts an abundance of fragrant flowers, and contain the largest rose collection in the Nordic Region dating back to the 13th century. The roses give a wonderful setting for the steel sculptures created by international artists. Inside the villa, you will find a café, gallery, and outdoor seating. Fully licensed. The sculptures in Rosehagen and in the surrounding area of Jørpeland is a result of the world’s only symposium of stainless steel, and is a collaboration between local and foreign artists, Scana Steel Stavanger, Strand Municipality and organized by the Melting Pot, an initiator and organizer of a number of activities in and outside Jørpeland. performed by Bart Bergen and Naeem Searle. Rosehagen Villa is a historical wooden villa beautifully placed in a big surrounding garden overlooking the Jørpeland Bay. The garden boasts an abundance of fragrant flowers, and contain the largest rose collection in the Nordic Region dating back to the 13th century. The roses give a wonderful setting for the steel sculptures created by international artists. A great hike along the river starting from the Jørpeland Harbor. A great trail along the river up to “Fossen” (the waterfall). If you are lucky, you may see adventurous youth jumping from “Stolen” (the Chair) down into the frothing waters. A guest harbor with a modern service facility (showers, toilets and washing machine), as well as gas and diesel. Near shops and attractions. In Jørpeland harbor. 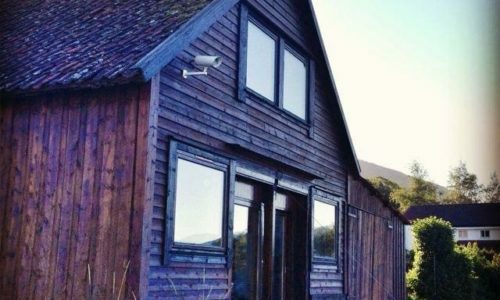 Offers electricity and a modern service facility. Waste disposal by RV13 by Jøssang. 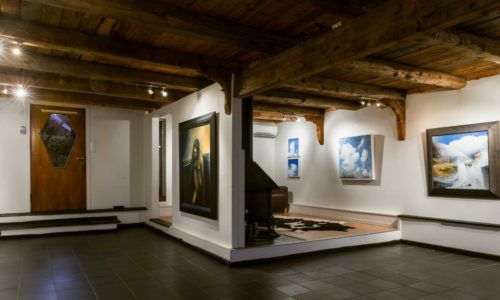 Gallery Skjæveland established 2007. operated and owned by the artist, Stian Heimlund Skjæveland (-73). 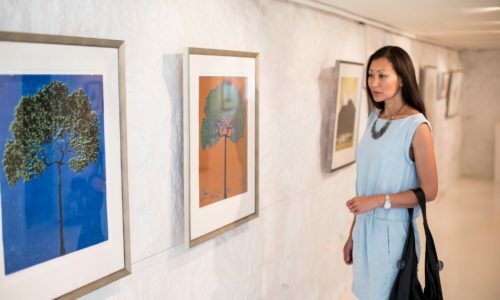 In the gallery’s showroom we show Norwegian contemporary art from renowned Norwegian to promising new artists. 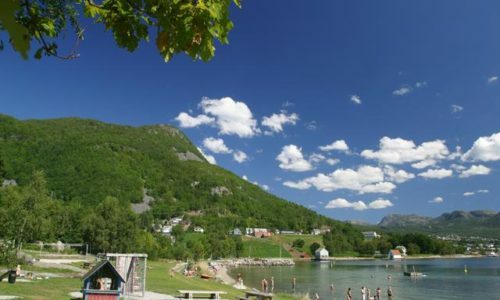 We lakeside location in idyllic surroundings near Jørpeland center. Visitors have easy parking and it is possible to moor a boat by sea. A great beach tucked away in a cove with a playground and two sandvolleyball courts. Great parking opportunities. Located approximately 5 km from Jørpeland city center. Steep access from the road, as such not recommended for campers/caravans. A breakaway from RV13 in the middle between Tau and Jørpeland. Toilet, playground and great fishing opportunities. Great hiking around the islet, and wonderful swimming. Accessed by boat. 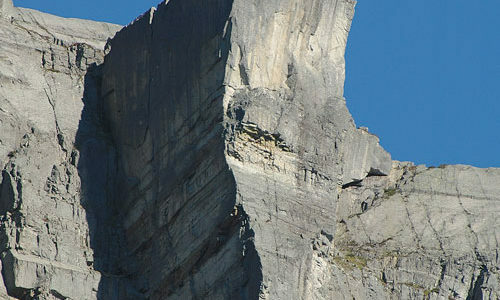 Located by the Preikestol Mountain Lodge (“Preikestolhytta”). Beach, toilets by the lodge. The Jørpeland mountains have several lakes with plenty of fishing opportunities. In most of these lakes there is license-free fishing with rod throughout the year. Alternatively, there is salmon fishing in the Jørpeland River during the months of June/July and August. Fishing licenses are available for purchase at Sport1 Jørpeland. Here you will also get information of which waters are license free for rod-fishing. 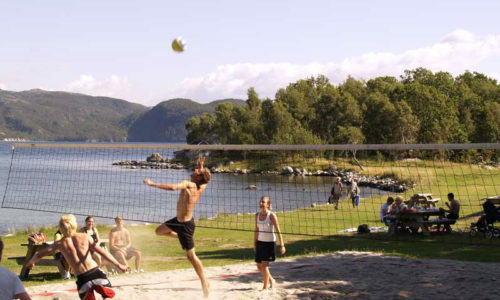 Preikestolen Mountain Lodge offers activities for all ages. You can try a wide variety of activities on water or in the mountain. Go paddling on a stand up paddleboard, in canoe or a kayak on your own or join a guided tour. We highly recommend a morning paddle where you usually can enjoy the scenery on perfectly still water.If you want to test yourself in the heights, we can offer you rock climbing and abseiling, or you can push yourself of a cliff for the 350 meter long zip-line! You can also spend the night in our exotic water camp. You will be sleeping in a hammock by the water, and be able to finish the day under the stars alongside the sparking fire. 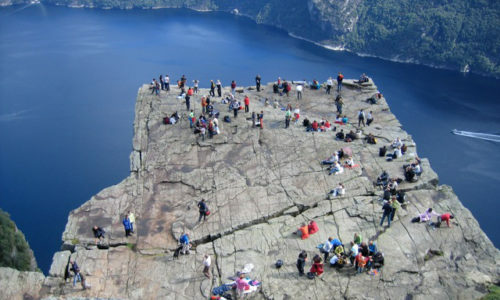 Preikestolen Golf Club is located 5 km from Jørpeland city center, and just 2 km from the Preikestol Mountain Lodge, by Preikestolen Camping. The course has 9 holes and is situated by a lovely valley with the forrest and mountains all around. Cozy streams trickle through the area, and if you are lucky, you may spot moose and deer. After a round on the course, you can visit the café in the club house which is open to everyone. (Only open during weekend). In Solbakk there are petroglyphs on Svadberg in the shoreline. The carvings are unik in the sense that they show two unique boat types. The area consists of at least 40 figures. In connection with the Mill operations in Tau, they built a magnificent park around the Director’s residence related to Tou Brug. This area is now open to the public, and “bruksløa” is open every Sunday from May to September. 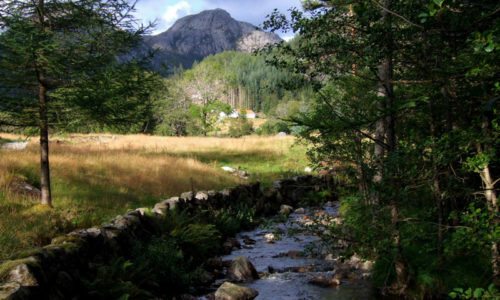 A popular walking area and often used by the locals. 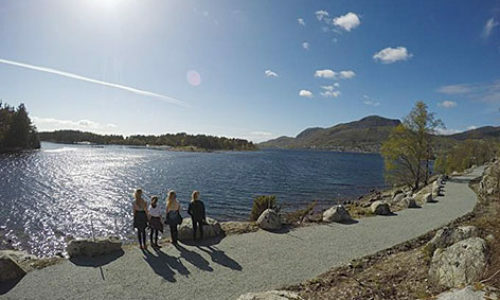 Follow the path along the Jørpeland river up to the magnificent waterfall with its salmon steps, where you may have the opportunity to experience the salmon’s travel up river. Follow the gravel road to the farm Selemork, which is now used as a cabin. Picnic area with benches and a beautiful view right above the farm buildings. Continue the walk further up, cross the river (bridge) and walk down on the other side of the river. About midway down you will cross the river again right by an old power station that made it possible to power the steel mill in Jørpeland back in the day. (The power station was in use until the new power station above was completed just a few years ago). Follow the trail back to the origination point. A walk most people will enjoy. Tunglandsfjellet (“The Tungland Mountain”) 388 mamsl. 2 hours. Follow the road up to Selemork for about 20 mins and take a right up a steep trail/gravel path. 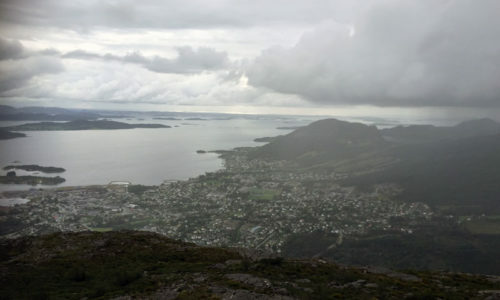 On the top of the road a trail will follow and lead you up to a great scenic spot on the top of the Tungland Mountain. 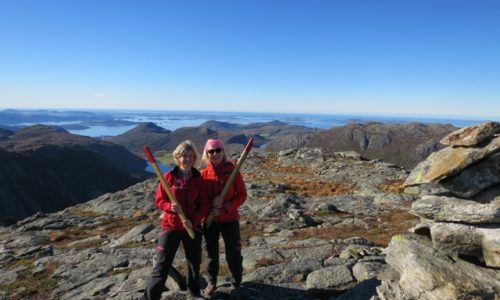 On days with great weather you will see far out into the North Sea, and many fjords and mountains in Ryfylke. Førlandsåsen (“The Førland Hilltop”), 520 mamsl. 3 hours. Follow the trail to Selemork to the top where you cross the river, and continue ahead for a few minutes until a sign points to the right. 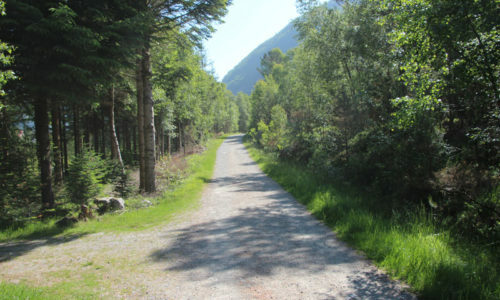 You will cross a paved road and follow the trail to Førlandsåsen. 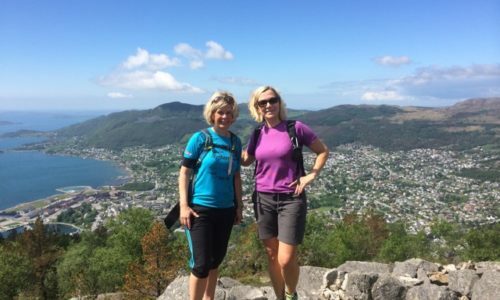 Follow the path that snakes its way up the hill and through the rock pile where you reach the top of the mountain to experience the wonderful views of Jørpeland, Stavanger and the fjords in between. Back in the circular track you can continue down and experience the old and new power station before crossing the river and return to the starting point. Heiahorn, 773 mamsl. 5-6 hours. Follow the trail to Selemork to the top where you cross the river and take a right up to the road which leads you in to Liarvatnet (the Liar Lake). Cross the bridge on the right side and follow the path to the municipality’s tallest mountain, the spectacular Heiahorn. This is a circular walk, and you can continue straight ahead from the mountain top and trail down the Småsilddalen right under the mountain. Roundtrip from the harbor the walk is approximately 18 km. If you drive to and park by Liarvatnet, the trip takes about 2 hours. PREIKESTOLEN LONG TRIP 7 – 8 hours. 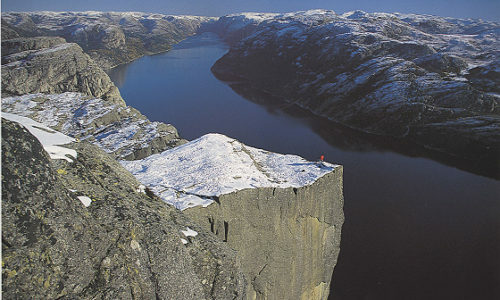 A newly marked trail that makes it possible to walk from Jørpeland all the way to Preikestolen. 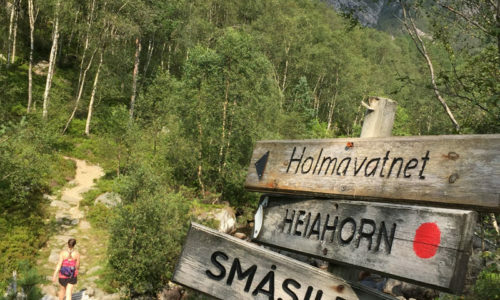 Follow the trail to Selemork for about 30 minutes, and follow the signing to the right into the valley and continue to the Preikestolen area. A wonderful trail with diverse nature. The distance roundtrip is 28 km. 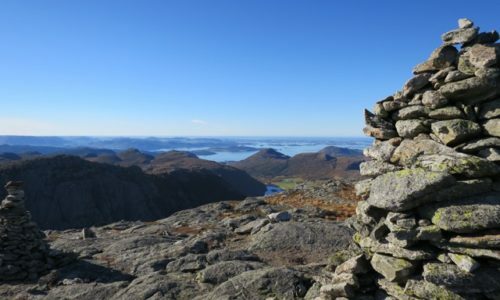 If Trolltunga is the next stop on your route, this trail will be a great starting point.